it's been a long (and brilliant) season with only one point in it at the top and a good scrap for fourth but in the end chelsea are champions with an emphatic 8-0 win over wigan. chelsea have a + 71 goal difference! 102 goals highest ever in the premiership! 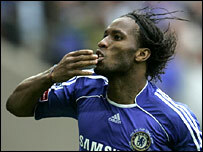 drogba wins the golden boot for top scorer with 29 goals! we did the double over man united, arsenal and liverpool! congratulations chelsea on winning the FA cup! last night of course i was in the pub watching the football with mike, joel and harry. meantime jen was at the grace knitting group - yes apparently it is the new rock and roll! a selection of our text messages... mine are in italics and i'm sure you'll detect the smallest hint of irony in the replies! at this point a message from kester - torres off? what is the tinker man doing?! see you in moscow! at this point a message from a fellow chelsea fan - praise jesus! so chelsea will play liverpool in the third champions league semi final in four years. chelsea turned it round last night with a 2-0 win - whilst it wasn't the greatest dispaly from the blues it was job done... it was my second visit to stamford bridge this season - i like the big european games. this time round the first leg rather than the second is at anfield which may mean we can break the reds jinx on us in europe!! this quote from the chelsea web site doesn't exactly give a lot away. josé took chelsea to winning the premiership twice, the FA cup, and the league cup twice all in three years. what more could you ask for?! i thought he was fantastic as a manager - fun, entertaining, arrogant, a wind up merchant, and brought a real edge to the premiership. it's easy to forget that when he arrived man united and arsenal were dominant. chelsea fans will be absolutely gutted. no doubt stories will come out about why - the rift with abramovich, a stuttering start to the season, too many chiefs and not enough control given to the manager... but it makes no sense and i would guess the players will be gutted (apart from shevchenko maybe). congratulations to chelsea lifting both cups this season! chelsea make it through to the FA cup final at wembley on may 19 winning in extra time 2-1 over blackburn setting up a final against man united. can't wait! 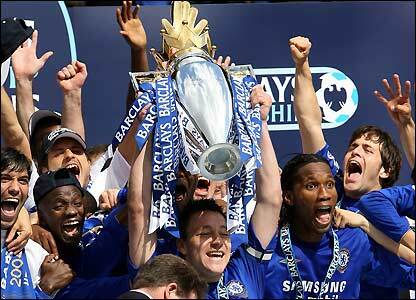 chelsea secured a second premiership title in a row. it was made all the sweeter because victory came with a 3-0 defeat of man united - wish i had been there. for this one-time event, onedotzero has invited over 20 key creatives from diverse fields, representing the full breadth of moving image programming that onedotzero explores. across motion graphics, music videos, short films, interaction design, live audio–visual performances, music, and architecture, featured artists will include airside, hi-res!, trevor jackson, allofus, the light surgeons, d-fuse, intro, jason bruges, neutral, peepshow, phillip o' dwyer, pre-loaded, sennep, tank.tv, universal everything, usman haques, and united visual artists.